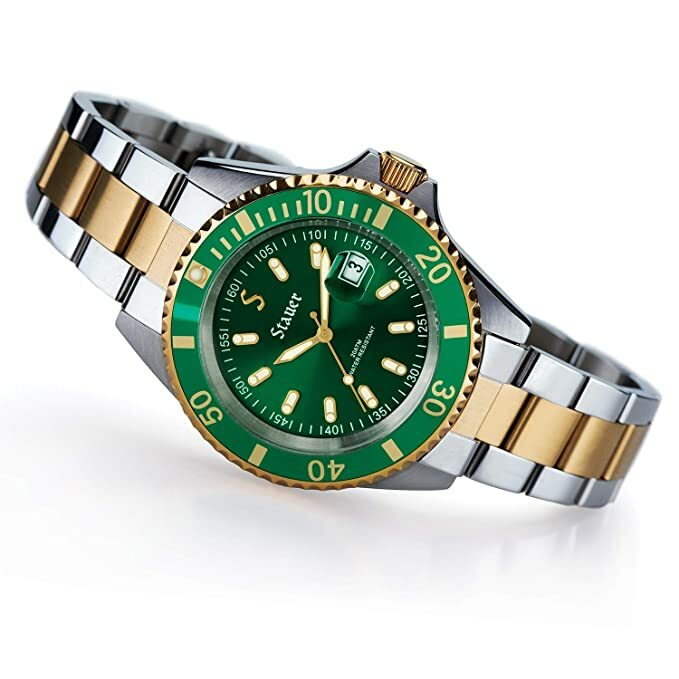 When it comes to buying watches at the entry level, things can be quite tricky. A substantial proportion of the entry-level watches are usually made from very cheap quality materials and don’t work for more than a couple of years at best. They also tend to be quite inaccurate and have poor build quality. I’ve had entry-level watches that stopped working within a month of its purchase. And the worst part is that you can’t really repair these things because repairing is just too costly to be worth it. Being a watchmaker, the amount I would usually charge to repair a watch would sometimes exceed the price of these watches themselves. So it’s a good idea to do a bit of research on the brand you’re going for before you invest in an entry level watch. Stauer is a reasonably decent brand that is quite new to the market but provides good quality watches at a price range that most can afford. 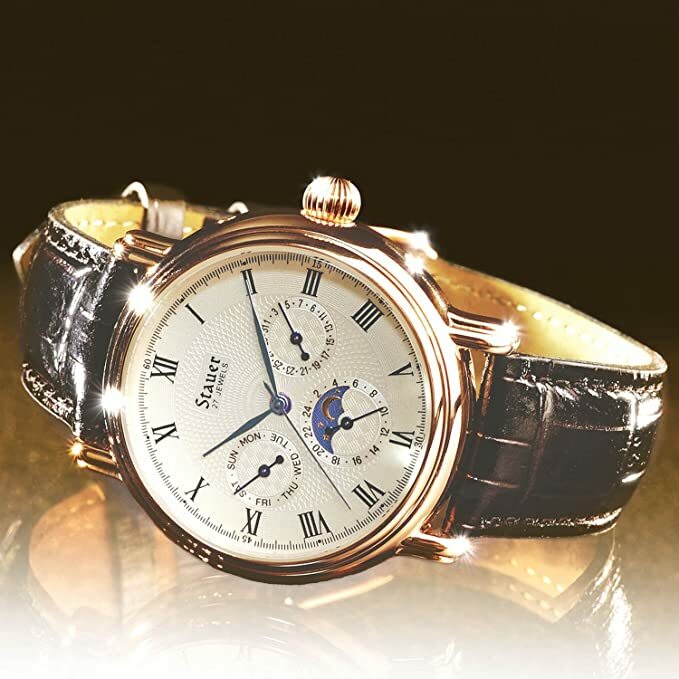 Where are Stauer’s watches manufactured? Stauer is an American jewelry brand that is dedicated to providing premium quality jewelry and watches at affordable rates. Although a relatively new entrant to the market, they have successfully managed to make a name for themselves, particularly in the entry-level wristwatch market. The primary reason behind their success is undoubtedly the affordability of their products, which they claim to maintain through a clever process of avoiding middlemen and efficient techniques of production. While reading up on the brand and how their production process works, I was really impressed by their production and marketing strategy. Stauer does not have wholesalers, and they also don’t pay big money to rent expensive shops or hire prominent celebrities to promote their products. They keep things clean and straightforward, which allows them to incur lower costs. They claim to have bought 2 million carats of emeralds and 9 million carats of Amethyst in the last year. Whereas a local store would purchase 20 or 30 Carats a year from different wholesalers who spike up their products by as much as 50 percent. 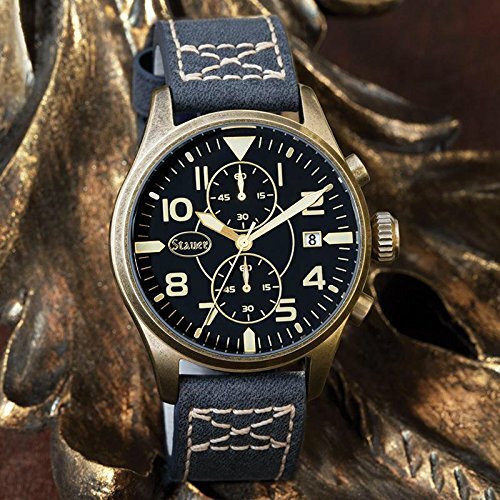 They stay true to their brand signature “afford the extraordinary” by offering a wide range of watches, jewelry, and accessories at surprisingly affordable rates. And unlike a lot of other brands in the same price range, their products are actually of pretty decent quality. With that being said, I’d also like to add that Stauer is, after all, an entry-level watch brand. Though their products are pretty good for the price, if you’re expecting a similar perfection and precision as that of the Swiss makers, you’d be pretty disappointed. So it’s best to keep your expectations realistic. Stauer’s story is quite an interesting one which began when the founder and CEO of the company, Michael Bisceglia bought a bracelet for his wife. It was a blue topaz and sterling silver bracelet from one of the top jewelers that cost him upwards of $1700. Though the bracelet was pretty nice, Michael felt it was drastically overpriced. And with some clever tricks and efficient business strategies, he was sure that he could provide similar high-quality products at much more affordable rates. That’s how Stauer came into existence! Michael’s beliefs were further strengthened when a local jeweler in Bali, Indonesia managed to create a much better-looking bracelet than the one he bought – at 1/10th of the original price! Since then, the brand has worked hard to create efficient business channels and employ clever cost-reducing marketing techniques to keep on delivering great quality products at an affordable price range. I know the answer is going to disappoint a lot of people, but I’ll explain how it is not entirely a bad thing. As you’ve probably guessed already, their watches are manufactured in the People’s Republic of China. They have factories in Hong Kong which mass produce their line of products, ranging from accessories such as handbags and sunglasses to watches. Though not every made in China product is terrible. 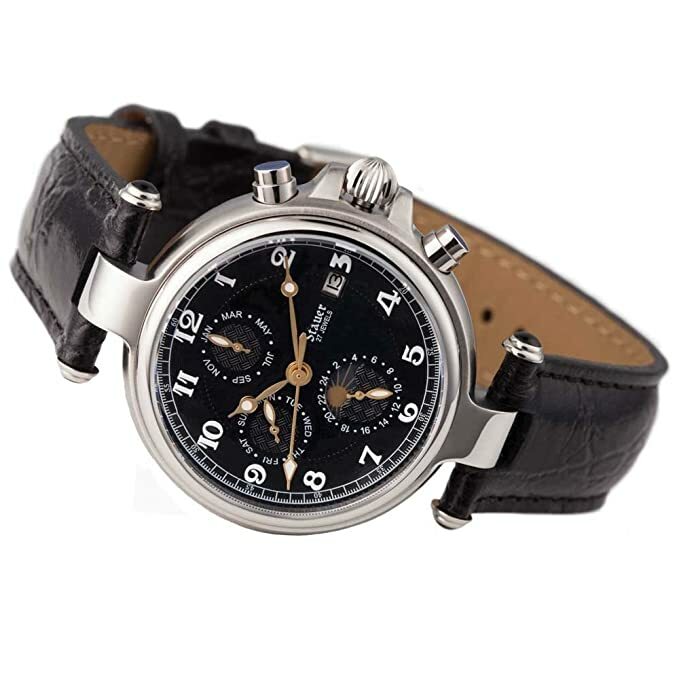 In fact, a lot of the commercial European and American watchmakers have several parts of their watches made in China. This includes a lot of big brands as well. I believe this is a great way to reduce costs, and from my experience of playing around with these made in China watches – a lot of them are of pretty decent quality. 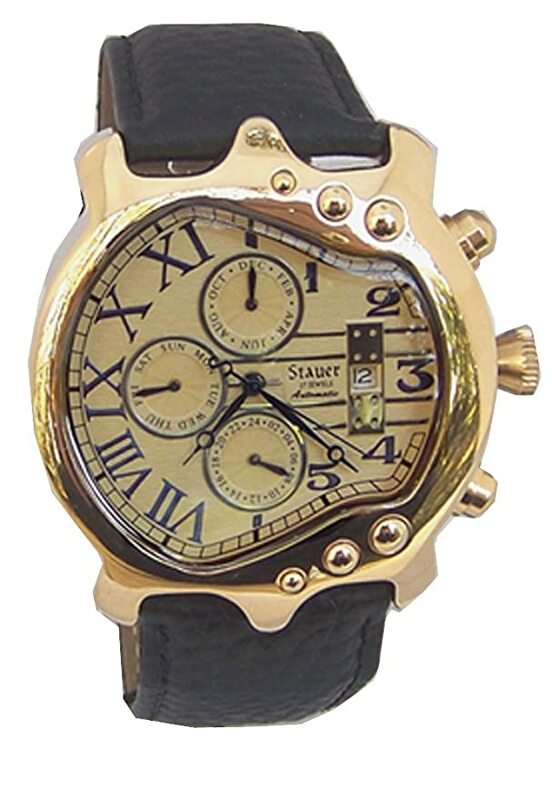 Stauer has an extensive range of watches for men, from sleek-looking chronographs to vintage coin and pocket watches. 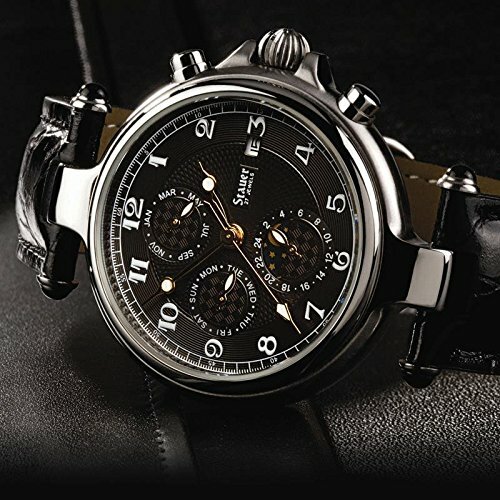 I requested a catalog from their website and went through their extensive range, and decided to go for the Stauer Noire Men’s Watch. While going through their catalog, I was fairly impressed with the features their watches were offering at such a low price. Although I didn’t have high expectations when I first ordered the watch from Stauer’s website, the watch actually turned out to be much more impressive than I thought. Through this timepiece, Stauer has brought back the “Noire” design – a style that was popularized by an elegant timepiece built way back in 1936. It is black dialed, complex and has a movement that is quite unique. 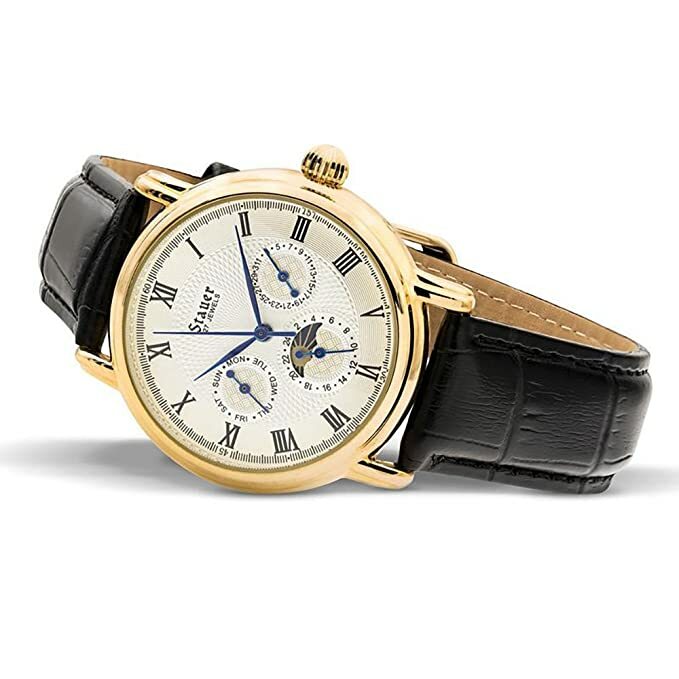 It has a pretty vintage look to it with the hands and the dials in classic gold and white combo. It also features a particular type of 27-jeweled automatic movement which is incredibly accurate. The three interior complications embedded in the face of the watch displays the day, month and date, giving a sophisticated overall look to the timepiece. However, I felt like the build quality was a little sub-par than some of the similarly priced but much less flashy watches that I own. 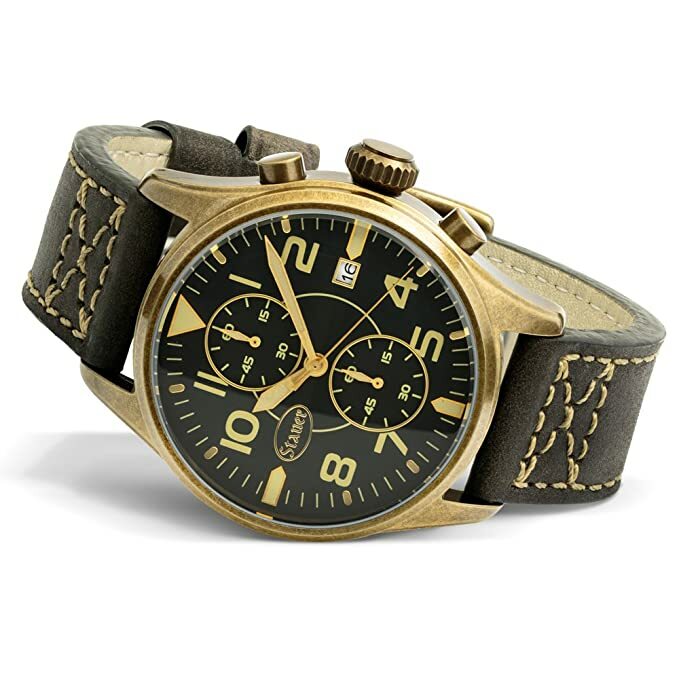 The leather strap felt was average, and the overall feel of the watch seemed a bit low-quality. If you aren’t looking to invest beyond $100-$150 and want an excellent looking, feature-packed timepiece, Stauer is a brand worth looking into. Although they won’t match up to the quality of the Swiss brands for sure, what you get for the money you invest is entirely worth it. That’s my honest Stauer watch review. Till next time!